This is actually the second front loader we have ever had. This one is a Bosch Nexxt 700 Series washer, and it's been crowding me out in the laundry room for about 5 years now. What this blatant boosterism is all about is that my sister asked a question about these things on Facebook. Quote: "I'm interested in buying a High Efficiency washer and dryer and I'm wondering if anyone could please let me know if they have one and how do you like it." Yes, Pat, we like it. In fact we have been using one here and one before it in Philadelphia since around 1999 plus or minus a couple years. We won't do without one. 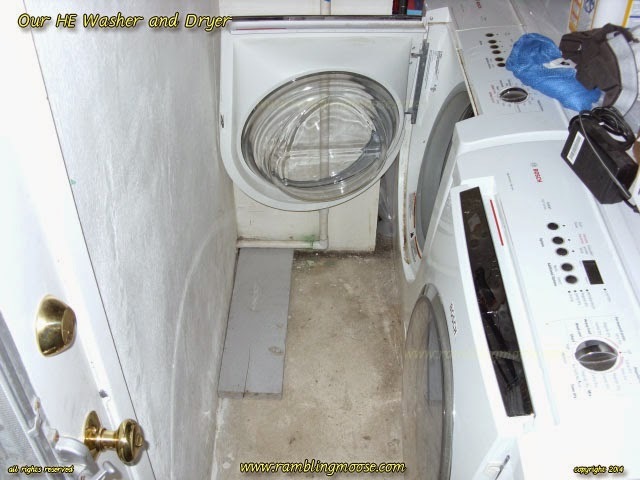 The one I had before it was a Maytag, and while we did have some teething pains until we learned that you have to keep the door open or else you would get mold or mildew in the thing, we have been very happy with them. My only problem with the ones here is that I'm physically broader at the shoulder than the room we crammed the things into. But that isn't the washer's problem is it. When looking for a washer there are quite a few things to look for. The rubber rings should not be white. They will discolor in any washer, and if you don't leave the lid shut, you will get mold on them. Mine are a battleship grey. Not my favorite color, but a good compromise. Make sure the washer has a timer on it. You will be surprised how well you will enjoy being able to load the washer and set it for a timed wash to be ready when you come home from work or when you wake up in the morning. Nobody likes to twiddle their fingers waiting on a washer that is running on your time. I can silence my beeper on the washer and set the thing to be done an hour before I wake up if I like. Usually when I do that, I wake up at that time anyway but that's my own little mental problem. You will want an extra hot cycle. My hot water is set for 125F here, that is per the British National Health Service recommendation. The NHS recommendation means that the water coming out of the tap will be hot enough to sterilize clothing so be careful. But on top of that my washer will heat the water to "ungodly hot". Somewhere above 140 if I remember right, although it could be warmer than 160. Perfect for when you have house guests or little brats staying with you. You never know what they're going to get into, do you? I always use HE soap. That was an education for me. I had to look for the logo and now I just buy the stuff in bulk at the wholesale store when I have a coupon. I now have back-stock for about a year of laundries. You will use less soap and much less water. I have paid for the washer by now with the savings on both soap and water. My utility bills dropped immediately by about $25 a month from the old school top loader that was beyond inefficient. The cups for the detergent are quite small. You will use about 1/4 cup of soap per load. I remember being taught to dump about a cup (8 ounces) of soap "back in the day" by Mom when I learned to do my own laundry. It will be an adjustment because you will have to learn how to load clothes. A front loader isn't what we grew up with. If it fits you can wash it. Don't cram it in, clothes will need "room to dance" but basically if it fits in there without being stuffed full, you should be good. I wash blankets in my home washer every week. Clean linens are nice, but sterile linens are something I still notice after all this time. When our Aunt Betty was still here, she had a big comforter that she was going to take to the laundromat to clean for the "next season". We took it to our house, tossed it in the washer by itself, set it for ultra hot, and sipped some port wine by the pool. A rather civilized way to do wash I would say. But the comforter came out sterile clean. We all were quite pleased. You can ask Aunt Betty about that. Finally, we did get the 10 year warranty. Since I live in South Florida, the electric power coming into the house is full of power pops and more surges than a menopausal woman. I lost more desktop computers than I care to count as a result of that, and went over to a laptop as a result years ago. You will have to decide whether this is good for you or not. I will say that all the problems we had with ours were in setting the thing up and we put a power filter on the washer, dryer, and the house in general as a result. I can ramble on about this thing, basically since you didn't ask about a "Specific Model" I am not raving about my washer so much as talking about the technology. But do your research. A Bad Washer is a nightmare, and you can avoid that by looking at review sites online. We're quite happy with ours, can you tell?